Recently, the website Quora decided to undertake a survey. Users were asked to name one dish which they felt was the best or most interesting which their country had to offer. The result was a list of 35 national dishes representing 35 different countries of the world. We present the list here, as a handy guide that will help you remember what to try should you visit any of these places. Bon appétit! Mussels are prepared in any number of ways (cooked with wine, butter, and herbs, or maybe a tomato-based broth) and served with salty, crispy fries. Wash it down with a refreshing Belgian beer. Wiener schnitzel is synonymous with Austria. It’s a very thin veal cutlet that’s breaded and deep fried. It’s usually served with lemon and parsley, and is accompanied by a side of potatoes or rice. Asado is the term to describe Argentina’s delectable grilled meats—and grilled Argentinian steak is especially delicious. It is true that most of the good meat goes to the so called first world countries via exports, but if you have a good ’asador’ (the guy making the asado) the taste will be priceless, especially if you’re in the countryside. Originally from Quebec, poutine is a delicious calorie-fest that will warm you from the insides: French fries topped with brown gravy and cheese curds. The most iconic Brazilian dish is probably feijoada, a stew of black beans and smoked beef and pork. It’s usually served with rice, collard greens, farofa (toasted manioc flour), hot sauce, and an orange slice to help with digestion. Often touted as the perfect hangover cure, a pie floater is an Australian-style meat pie that’s sitting in a bowl of thick green pea soup. It’s sometimes topped with tomato sauce, vinegar, and salt and pepper. It’s difficult to select just one dish for such a large and varied country as China, but xiaolongbao (soup dumplings) are certainly one of the country’s most memorable foods. Originally from Shanghai, these dumplings are usually filled with some sort of meat and soup broth and steamed in a bamboo basket. Paški sir is a hard Croatian cheese that’s made from sheep’s milk. It’s made in the island of Pag and is so famous that it’s exported around the world. Molokhia is served throughout northern Africa, but is especially popular in Egypt, where it’s believed to have originated. The Egyptian version of the dish uses Molokhia leaves (a type of bitter vegetable) that are stripped from the stems, then finely minced and cooked with coriander, garlic and stock. It’s generally served with chicken or rabbit, or perhaps lamb or fish. Roast beef and Yorkshire pudding is considered the national dish of England. Sop up the flavor of the beefy gravy with the hot doughy bread. Khachapuri is a savory, chewy bread that’s filled with bubbling cheese or egg originating in the Caucasian country of Georgia. Soused herring is a raw herring filet that’s marinated in a preserving liquid that might consist of cider, wine, sugar, herbs, and/or spices. The dish is best eaten on a fresh toasted roll and topped with chopped onions. It’s nearly impossible to choose just one dish to sum up India. 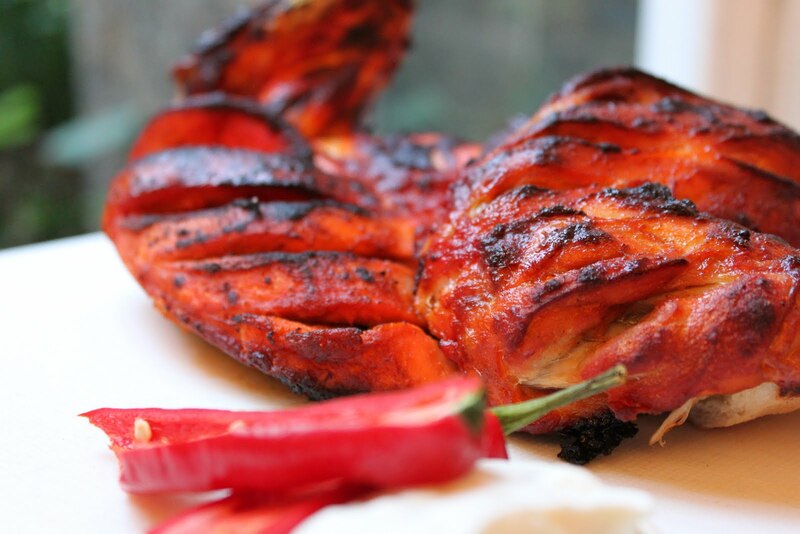 But if we had to choose just one iconic Indian dish, we’d have to go with Tandoori chicken. The dish consists of chicken that’s spiced with tandoori masala and roasted in a tandoor, a type of clay oven. It’s often served with vegetables, yogurt sauce, and rice. Martabak Manis is a sweet, thick Indonesian pancake. The top and bottom parts are basically spongy pancake, while what’s sandwiched in the middle can be anything sweet you can dream of—ranging from chocolate sprinkles to grated cheese to peanut pieces (or even banana pieces!). You can buy them from street vendors around Indonesia. Pizza originated in Italy—and Naples, a city in southern Italy, is its birthplace. Neapolitan-style pizza is chewy, crunchy and topped with high-quality ingredients like fresh tomatoes, buffalo mozzarella, basil, and any number of meats. Here, pizza is an art. Sushi might seem like the obvious choice for an iconic Japanese dish, but Katsudon is not to be missed. Katsudon is a crispy, deep-fried pork cutlet topped with egg and condiments and served over a bowl of rice. Widely considered the unofficial national dish of Malaysia, nasi lemak consists of rice cooked in coconut milk and pandan leaf. It’s traditionally served wrapped in banana leaves and is often accompanied by sambal chili, ikan bilis (anchovies), peanuts, and boiled egg. With up to 100 ingredients, mole sauce is one of the most complex and flavorful sauces in the world, resulting in a rich, creamy, chocolatey and spicy flavor. It’s originally from the Puebla and Oaxaca regions, but you can find mole sauce—usually doused over chicken or enchiladas—all over Mexico. Rakfisk is trout that’s been salted and fermented for a few months. It’s then eaten without being cooked, often accompanied by onions and sour cream. Adobo may be a popular spice, but in the Philippines it’s a dish that showcases some type of meat (pork or chicken) cooked in vinegar, soy sauce, garlic, and oil. It simmers in the marinade for a while, soaking up the flavors. The dish is so popular that some call it the unofficial national dish of the Philippines. Francesinha (meaning «little Frenchie») is a Portuguese sandwich made with bread, ham, linguica (smoked pork sausage), and steak, that’s topped with melted cheese and doused in tomato sauce. The sandwich is a carnivore’s dream that’s best served with a side of fries and a cold beer. 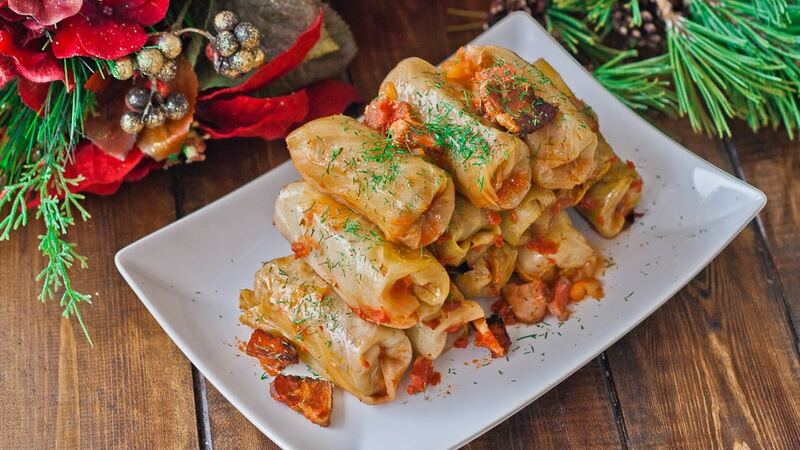 Sarmale is essentially pickled cabbage leaves stuffed with a mix of rice and seasoned minced meat. It’s consumed during the winter and is very popular in Romania. Any visitor to Russia is «obligated» to try borscht, a soup made from beet roots. It’s generally served cold (though it can be hot too) and often topped with a dollop of sour cream. Kabsah is a flavorful rice dish that’s made with lots of spices, like cloves, cardamom, saffron, cinnamon, pepper, nutmeg, and bay leaves. It’s usually mixed with meat and vegetables, making for a hearty meal. You can find it all over the Middle East, but it’s especially popular in Saudi Arabia. Smoked salmon is a must-have dish in Scotland. Scots squirt the salmon with fresh lemon and eat it on simple brown bread with either butter or cream cheese. Bryndzove Halusky are little potato dumplings served with a soft sheep’s milk cheese (bryndza) and bacon. Kranjska klobasa is a Slovenian pork sausage similar to kielbasa, but a bit smaller. It’s made with pork (about 20% of which is bacon), salt, pepper, water, and garlic—and nothing else. Koreans love banchan, which basically means small dishes that are served with rice and are meant to be shared. Small dishes might be kimchi (fermented spicy cabbage), guk (soup), gochujang (fermented chili condiment), jiggae (a type of meat or vegetable stew). Jamón Ibérico, proposed by Quora user Miguel M., is a savory cured ham that’s cut from the hind leg of a pig. It’s an iconic Spanish dish best served with a hearty glass of wine, crusty bread, and olives. Shawarma remains one of the most popular dishes in the UAE. It’s a sandwich on pita bread that’s stuffed with shaved roasted meat (usually a mix of lamb, chicken, turkey or beef) and vegetables. It’s often topped with tahini, hummus, or hot sauce. 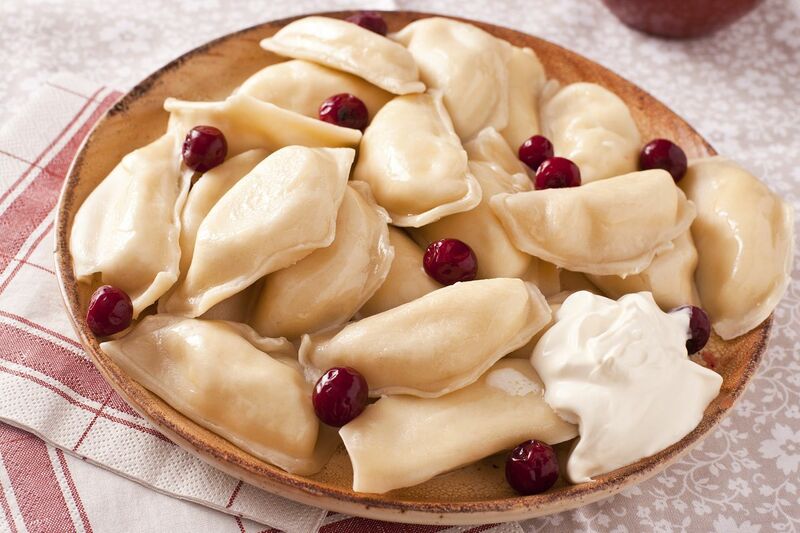 Varenyky are or dumplings stuffed with mashed potatoes, cheese, sauerkraut, cabbage, or meat. They can be boiled or steamed, and typically come with toppings like fried salo (pig fat) and onions, along with smetana (sour cream). The U.S. is so vast and the cuisine so varied, it’s nearly impossible to select just one dish to sum up American cuisine. But if you really twist our arm, we’d have to go with the all-American hamburger—especially when you pair it with crispy fries and a hearty milkshake. Pabellon criollo consists of white rice with stewed black beans, and «desmechada» (shredded) meat. It’s often served with a fried egg and fried plantains.